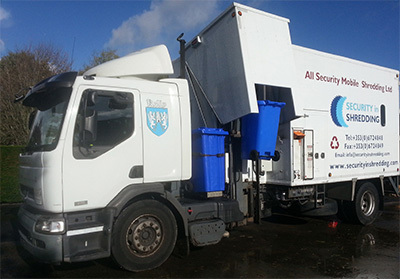 Security in Shredding’s shredding services is available to all potential and current clients in The Leinster Region. Our Services include Onsite Paper Shredding, Offsite Paper Shredding, Onsite Product Destruction, Electronic Media Shredding and general Recycling Services. Our innovative industry leading services coupled with our highly professional staff have proven to position our service quality at the top of the market with total customer satisfaction achieved with every service delivery. 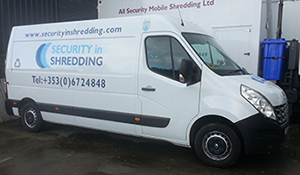 Not only do we at Security in Shredding possess a 100% unblemished track record when it comes to confidentiality and customer satisfaction achieved, we bring the level of service quality further by setting new standards within the industry. That results in our services being the most confidential paper shredding services available in Ireland. This is not just our words as our clients are aware and appreciative of our innovation and service perfection (Testimonials available upon request). Our responsive Onsite Paper Shredding Services cater for all clients witin The Leinster Region. Our Onsite Paper Shredding Services involve one of our industry leading innovative shredding units arriving at The Clients premises providing the highest level of confidentiality available within the market. An essential design application of our onsite shredding units is the fully automated material feeding system, this results in our shredding staff controlling the shredding process from outside of the shredding unit. The previous shredding technologies that the shredding market is saturated with requires the shredding staff entering the rear of the shredding unit with the client’s confidential material as it is not fully automated. These old systems has proven in the past by shredding companies not to be fully confidential as percentage levels of the confidential material can simply be withdrawn from the hopper prior to entering the shredding process. The fully automated shredding systems that Security in Shredding utilise during their innovative paper shredding service is yet another example of how we have increased the level of confidentiality & peace of mind provided to the client. Fully auditable Certificates of Destruction are provided to the client at the invoicing stage in order for full traceability of the clients confidential shredding. Our Offsite Shredding Service is provided to current clients and is available to potential clients within The Leinster Region. At Security in Shredding we are data destruction experts and we strive to consistently increase the level of quality and standards available to our clients. With this in mind we do not depend on recycling revenue from the material we shred and in turn we do not store client’s material. We are solely concerned with the level of Confidentiality, Customer Service and Security provided during our paper shredding services and we receive satisfaction and achieve our mission statement from providing our clients with total peace of mind that their material is being destructed with the highest level security. Our innovative offsite shredding service has been strategically developed with a “Same Day Destruction” policy for all material collected within our secure collection vehicles with certificates of destruction provided during the invoicing stage. This is achievable as we do not wish to store client’s material in order to build up a quantity of confidential material that is of a certain grade in order to maximise recycling revenue during exportation to paper mills, this is another point illustrating how we at Security in Shredding strive to provide awareness to our clients of the sever risks certain service deliveries provide. At Security in Shredding we provide high security paper shredding clear outs “Purge” shredding. For our clients with such requirements we can cater for their needs with both our Offsite Paper Collection & same day Shredding Service delivery in addition to our Onsite Paper Shredding Service delivery with very little lead time. Our responsive service deliveries provided by our expertly trained staff truly provide our clients with total peace of mind and satisfaction during ever service delivery. All of our confidential paper shredding services provides the client with the preferred and most suitable option of Secure Consoles, Secure Storage Sacks and/or Secure 240 Litre Receptacles. Please see our Product List for further information in relation to our products.